I’m in the middle of making small modifications to my Hyperlite Mountain Gear 4400 Southwest backpack, and to personalise it a bit I want to sew additional bits of webbing to the pack. 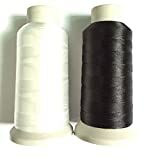 After googling for a while, I’ve decided on buying 69 nylon thread and a Speedy Stitcher Sewing Awl. I was worried I’d have to buy a sewing machine or pay someone else to do the job but from what I can tell, these two things will be enough. The Speedy Stitcher Sewing Awl acts a bit like a manual sewing machine. I bought some nylon webbing but it’s not very high quality, so I might just use a camera strap which came with one of my camera bags. As previously stated in another post, I’ll provide proper photographs and whatnot when I’m done. Here’s a couple to show you the general idea. The pictures are a bit confusing, but my camera bag will probably sit below the side pocket on the right photograph. The two upwards arrows are demonstrating another point you can sew onto if you wish. The photograph on the left shows different points you can attach things too, but I wouldn’t trust all of them i.e. they might not hold much weight. Using some webbing around the side belt, towards the back area, and then another support somewhere else, I should be able to hold my camera bag. I’m not sure if I’ll have to offload some of the camera’s weight to the shoulder strap (for no other reason than comfort.) I’m also not sure how much weight one particular point on the shoulder strap can hold, so I’ll have a look. I don’t really want to sew anything to the backpack itself as I don’t want to accidentally sabotage it.